Plymothian Transit Extra ©Jeff Day: First Devon & Cornwall B7RLE/Eclipse on Royal Parade, Plymouth on 1A. 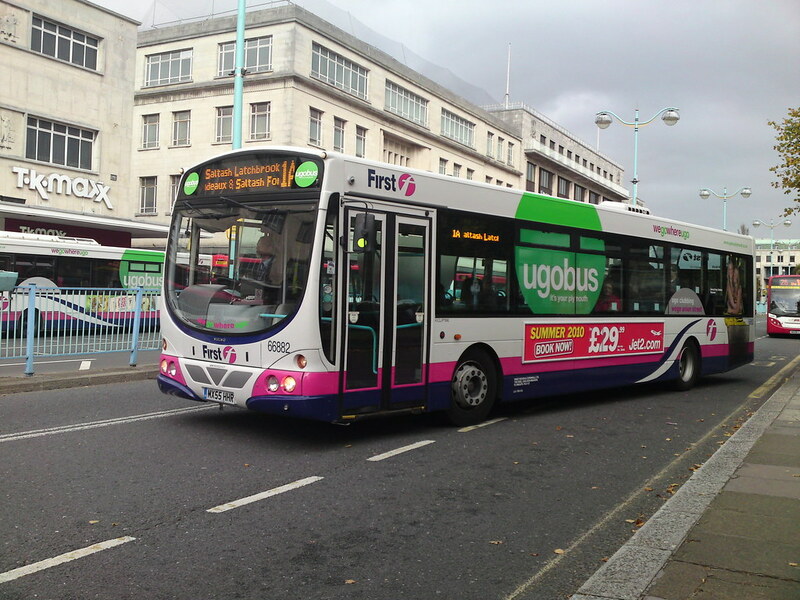 Tomorrow is one of the more important day for Plymouth bus services as it sees the start of First's new Ugobus services. Apart from a few minor incursions on each others traditional operating areas this is the first major outbreak of competition since the last great Bus War back in the 1980s. First will be hoping to get a good head start with flat fares of £1 for the first two weeks which of course takes us up to when Citybus start their new service 5 5A into Plymstock. The new services have of course been covered on Plymothian Transit but they now also have their own route page on my sister Plymothian Transit Extra Site where there are new up to date maps and links to timetables etc. What routes next for First...How about Whitleigh, (44) Ham (35) and Brake Fm/Crownhill (62) ??? I would guess the Whitleigh route would be high on any list!